On the can of DE1615, the instructions say to use an engine primer on bare metal. However, your instructions on this (Dupli-Color) website don't mention to use it...what's the correct answer? I looked at Canadian Tire, Wal-Mart, and an auto parts store but no one stocks the primer and they think it's not required. Now what? [/align]Note: I found out later in the day that Engine Primer DE1612 is available in the U.S., but not in Canada. For those of us in Canada, look for VHT products. Thank you for your inquiry with Dupli-Color. You would want to use the Engine Primer DE1612 on bare metal applications for the best performing system. A primer is always recommended for the best results. Bare metal or previously coated, a primer will offer better adhesion. You can find VHT products at Summit Racing and ATECH Motorsports. Any vendor that carries Dupli-Color can order any VHT product as we are both owned and operated by the Sherwin Williams Co.
Can labels will always be up to date and accurate and I would refer to them for proper application instructions. 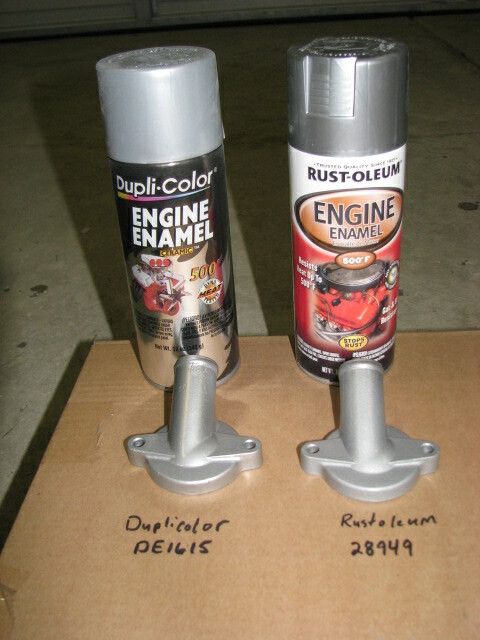 [/align]Engine Primer Dupli-Color DE1612 available in U.S.
Engine Paint Dupli-Color DE1615 available in U.S. I hope this helps with everyone's future projects. I used Krylon #41403 on my engine several years ago without any primer and it's doing fine still. I think Canadian Tire sells it. My concern with primer is that unless it is silver in colour, then any rock chips will look like hell if the primer shows through. At least by not using primer, the worst is that the engine colour will show through. go VHT if you want the best. dupi-color was invented for girl's. [/align]Engine Primer Â*Â* Â* Dupli-Color DE1612 available in U.S.
Engine Paint Â* Â* Â*Â* Dupli-Color DE1615 available in U.S. This is a useful thread, I'll move it to the reference forum now. Many years ago I painted a gas tank with Dupli-Color, the first time it saw gas the paint dissolved. I wrote to them and sent the paint back and in their initial reply they said I was wrong and that their paints were not soluble in gas, but they would investigate. A while later I got a package of new primer and paint and a nice letter saying that they had investigated and found that in fact that formulation was gas soluble and thanked me for bringing it to their attention. A company with that kind of customer service is definitely worth supporting. Acaution with Duplicolor high temp. engine paint is you have to complete all coats in the specified time. You cannot re-coat after the paint dries. Even years later the old paint will wrinkle badly. I didn't use the primer so that may be the difference. FYI to the forum. Last week I went to buy Duplicolor DE 1615 for my GL1100 restoration. Autozone had only 1 can of DE 1615, and the rest of the shelf slot was filled with Rustoleum 28949. 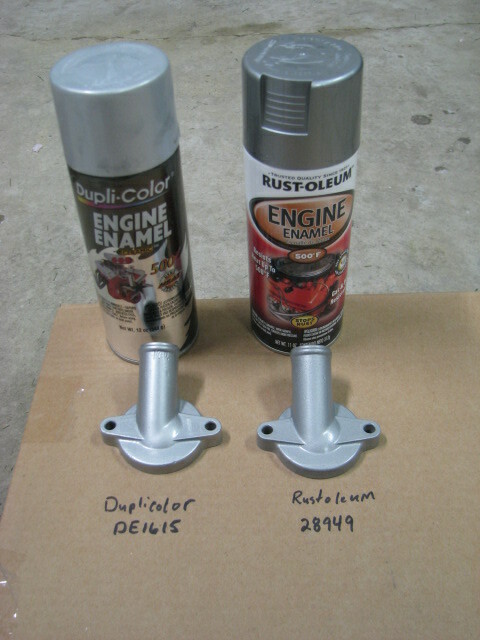 The Autozone folks said Duplicolor was purchased by Rustoleum, and the 28949 was the replacement paint. I painted two lower hose connectors, one with DE 1516, and one with 28949. The Rustoleum looks a little darker whenthe camera flash was not used. Life is too short - Live like today is your last day on earth!!! If I go to my maker with a few bumps and bruises, it just means I took the scenic route! I always keep a can of duplicolor black in the garage and just want to say that their engine enamel is much better looking paint after drying than their regular stuff. I have been using it instead of regular black for everything, not only engines. try it, I bet you guys will agree.